Pressurized water systems usually consist of potable and grey water systems, HVAC systems, Fire Suppression, Compressed air systems, Conduit piping and water mains. Non-Pressurized pipe systems are usually Mains, Horizontal Laterals, Vertical Stacks, Sanitary Systems, Storm/Roof Drains, Vent Systems, Processed/Industrial/Chemical Piping, and Other Waste Systems. Nu Flow is the industry leader when it comes to epoxy lining. Nu Flow has patented its pull-in-place structural lining process along with its epoxy coating system. The easiest way to determine which process is used for a particular project or scope would be by breaking the piping systems into two categories, pressurized and non-pressurized piping systems. Epoxy pipe lining was brought to North America in 1987 by American Pipe Lining. The company began employing its epoxy lining technology as a sole source contractor to the United States Navy aboard its carrier vessels. American Pipe Lining’s success with the U.S. Navy brought immediate attention to land-based clients that required similar services in their buildings and underground piping installations. Following EPA approval of its coating in 1988, American Pipe Lining began providing in-place pipe restoration services to clients that faced aging potable water systems and poor water quality, including a variety of low and high-rise housing developments, schools, industries and water utilities. 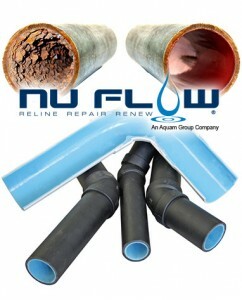 In 2006, APL granted an exclusive license to Nu Flow to utilize all technologies and patent right, making Nu Flow the only pipe and drain Rehabilitation Company which both manufactures and installs combined technologies for pressurized water systems, as well as trenchless repair on non-pressurized systems. Nu Flow acquired APL in 2007, solidifying Nu Flow’s position as the industry leader in small diameter pipe lining. What is In-Place epoxy pipe lining? In-place epoxy pipe lining is a process that restores corroded or eroded piping systems without the costly expense and disruption of pipe replacement. Why is pipe lining a better option than a repipe or replacing the pipes? In the early 1970’s, Eric Wood developed the first cured-in-place pipe technology (CIPP) in England. He then named the CIPP process insitu form, meaning “form in place” in Latin. Wood received patent no. 4009063 for this technology on February 22, 1977 and was commercialized by Insituform Technologies on February 22, 1994 when CIPP entered the public domain. During this time the CIPP market’s main focus was on large diameter pipes from 10 cm to 300 cm and geared towards the municipal sector. This process was called “inversion” and required large equipment and in most cases, would require digging pits for it to effectively work. During the 1990’s in Toronto, Canada a new technology would emerge in the CIPP market. Cameron Manners, the founder of Nu Flow and inventor of the technology, saw a void in the CIPP market and developed a pull-in-place method that focus on the small diameter market of 5 cm to 30 cm pipes. Nu Flow has received multiple patents for its pull-in-place structural lining process and methods and since its inception has licensed the technology to nearly 400 companies internationally with installation on 6 continents. Nu Flow’s pull-in-place method has revolutionized the CIPP market by bringing the structural liner inside the building. Nu Flow has been the leader in inside infrastructure rehabilitation. The pull-in-place method requires the use of existing access points along with the flexibility in the product and how to apply it. The process allows for full control by pulling or pushing the liner into place, a perfect match for large projects within the building’s infrastructure. What is Pull-in-Place pipe lining? Pull in place pipe lining is an effective process that restores corroded or eroded drain, waste and vent piping systems without the costly expense and destruction required to replace pipes. Why is pipe lining better than replacing the pipes? Pipe replacement in aging facilities, the traditional alternative to pipe lining, comes with a host of concerns and issues that must be dealt with, some of which can render such work highly prohibitive.